^ ICJ Reports 1986, p.150. ^ ICJ Reports 1986, p.14. ^ "Report of the Security Council - 16 june 1983 - 15 June 1984", pp.47-48. ^ ICJ Reports 1984, p185-188, para.41. ^ Memorial of Nicaragua. p. 403, paras163-165. http://www.icj-cij.org/docket/files/70/9617.pdf. ^ ICJ Reports 1986, p.17, para.10. ^ ICJ Reports 1986, pp.146-149. ^ "Report of the Security Council - 16 June 1986 - 15 June 1987", p.26. ^ "Report of the Security Council - 16 June 1986 - 15 June 1987", p.29. ^ "Report of the Security Council - 16 June 1986 - 15 June 1987", pp.52-54. ^ ICJ Reports 1987, pp.188-190. ^ ICJ Reports 1991, pp.47-48. “Treaty of Friendship, Commerce and Navigation (with Protocol). Signed at Managua, on 21 January 1956” (英語、スペイン語、フランス語など) (PDF). Treaties and international agreements registered or filed and recorded with the Secretariat of the United Nations (United Nations Treaty Collection) 367 (5224): pp.3-55. http://treaties.un.org/doc/publication/UNTS/Volume%20367/v367.pdf. (PDF) Report of the Security Council - 16 June 1986 - 15 June 1987. 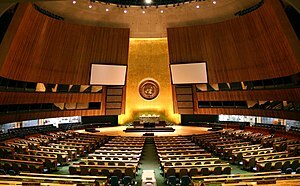 General Assembly of the United Nations. http://www.un.org/en/ga/search/view_doc.asp?symbol=A/42/2. (PDF) Report of the Security Council - 16 june 1983 - 15 June 1984. General Assembly of the United Nations. http://www.un.org/en/ga/search/view_doc.asp?symbol=A/39/2(SUPP). 仮保全措置命令(1984年5月10日)、 “Military and Paramilitary Activities in and against Nicaragua (Nicaragua v. United States of America), Provisional Measures” (英語、フランス語) (PDF). ICJ Reports 1984: pp.169-188. http://www.icj-cij.org/files/case-related/70/070-19840510-ORD-01-00-BI.pdf. 先決的判決(1984年11月26日)、 “Military and Paramilitary Activities in and against Nicaragua (Nicaragua v. United States of America), Jurisdiction and Admissibility, Judgment” (英語、フランス語) (PDF). ICJ Reports 1984: pp.392-443. http://www.icj-cij.org/files/case-related/70/070-19841126-JUD-01-00-BI.pdf. 本案判決(1986年6月27日)、 “Military and Paramilitary Activities in and against Nicaragua (Nicaragua v. United States of America), Merits, Judgment” (英語、フランス語) (PDF). ICJ Reports 1986: pp.14-150. http://www.icj-cij.org/files/case-related/70/070-19860627-JUD-01-00-BI.pdf. 賠償額算定のための陳述書提出期限命令(1987年11月18日)、 “Military and Paramilitary Activities in and against Nicaragua (Nicaragua v. United States of America), Order of 18 November 1987” (英語、フランス語) (PDF). ICJ Reports 1987: pp.188-190. http://www.icj-cij.org/files/case-related/70/070-19871118-ORD-01-00-BI.pdf. 裁判終了命令(1991年9月26日)、 “Military and Paramilitary Activities in and against Nicaragua (Nicaragua v. United States of America), Order of 26 September 1991” (英語、フランス語) (PDF). ICJ Reports 1991: pp.47-48. http://www.icj-cij.org/files/case-related/70/070-19910926-ORD-01-00-BI.pdf.